Is a Big Tax Refund Really a Good Thing? Lots of people over-withhold on their income taxes during the year in order to create a large tax refund at tax filing time. They see this strategy as something of a forced savings plan – in effect, they put the money on deposit with the government and then get it back in a lump sum when a file their returns. On the surface, this can seem like a winning strategy, at least until you consider the alternatives in some detail. In point of fact, you don’t need to give your money to the government so that they can save it for you. What are the benefits to keeping your income tax refund to a minimum? Since the money that is withheld from your paycheck is money that you have earned, it’s your money – not the government’s. You should not want to give it over to them so easily. You probably have better uses for the money anyway. Simply by using a payroll savings deduction – which is exactly what you’re doing with income tax withholding – you could direct the money into a savings account that you can use as an emergency fund. And a well-stocked emergency fund is better than a lump sum income tax refund any day. It will give you control of the money, to use for whatever purpose you think is necessary, during the course of the year. And you won’t have to wait for it to arrive either. This is a point that few people ever give much thought to, but tax collection authorities are a government bureaucracy – and bureaucracies do make errors from time to time. It would be a total nightmare situation if a $5,000 income tax refund is held up because someone at the IRS made a keystroke error in enterinvg data. And it is not as easy to straighten out errors with government agencies as it is with a local bank. 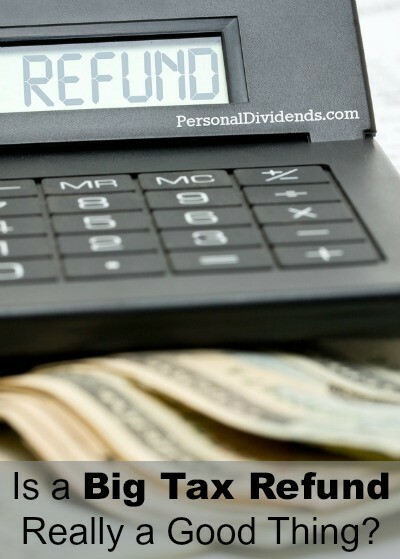 By keeping your income tax refund to a minimum, you can avoid having to fight to get your own money back because of someone else’s error. In an effort to ensure a large income tax refund, people will sometimes take loans in the short run in order to deal with the reduced cash flow from over-withholding. And sometimes other obligations crop up by the time the refund arrives, and a short-term debt suddenly becomes long-term. If lowering your withholding tax enables you to avoid having to borrow money in order to survive, that is the better course than trying to work out a forced savings plan with the government. With the money in your own hands, you’re free to do whatever you like with it. We already touched on the possibility of having a direct deposit into a savings account for an emergency fund, but you can use it for other constructive purposes too. Increasing your contributions to your retirement plan. Saving for a vacation (so that you will not have to borrow or wait for your income tax refund). Making a larger down payment on a new car. Helping to pay for your children’s university education, lowering reliance on student loans. Investing the money to make even more money. This is a short list of the possibilities of what you can do with the money that you don’t turn over to the government prematurely. Trust yourself to manage your own money better than the government can manage it for you. Keep both your withholding taxes – and your tax refund – as low as you can get them.